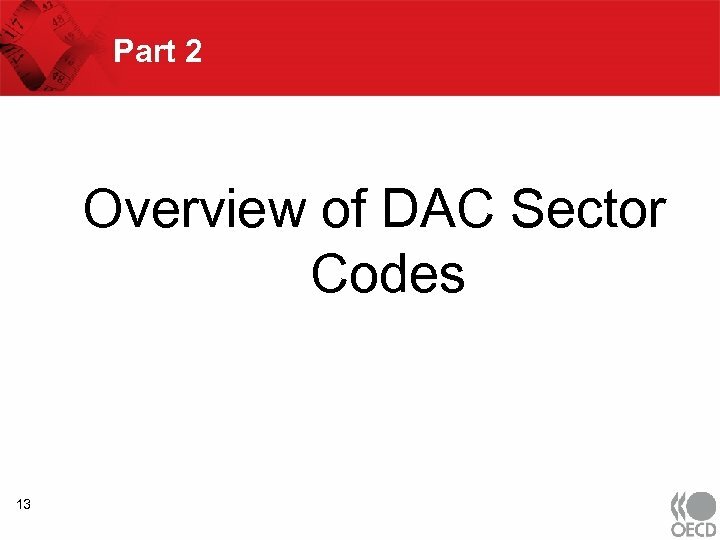 What is the DAC? 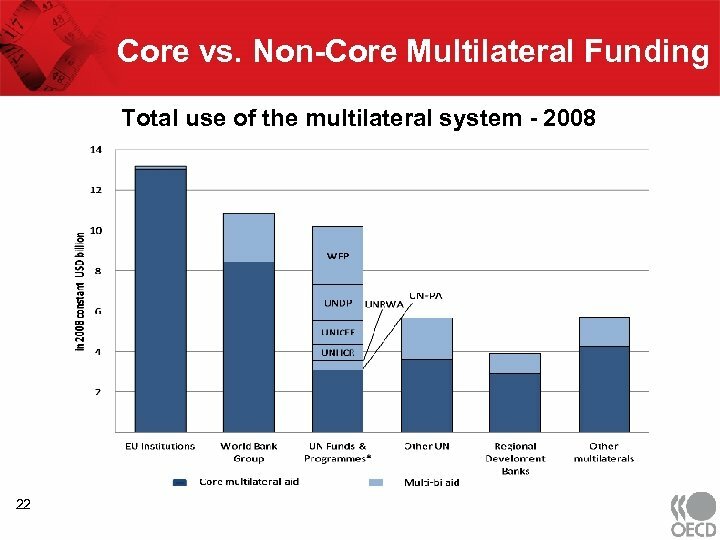 • • 23 Bilateral Donors, plus European Union. 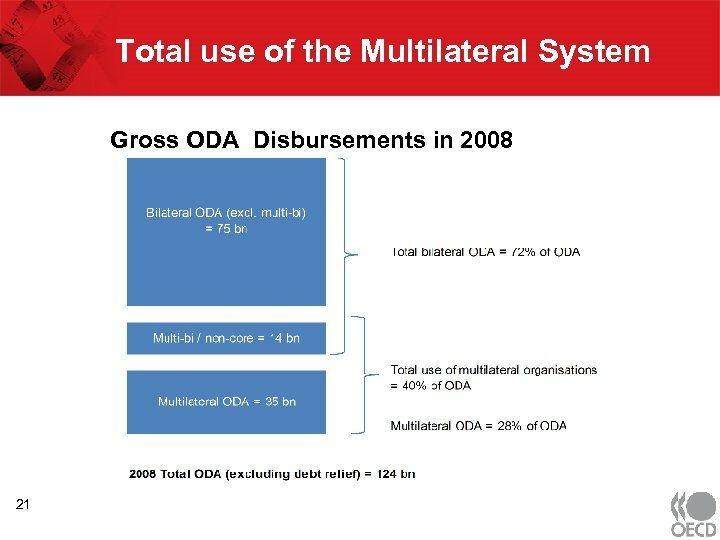 • Objective: improve development assistance through coordination and collaboration with major stakeholders. 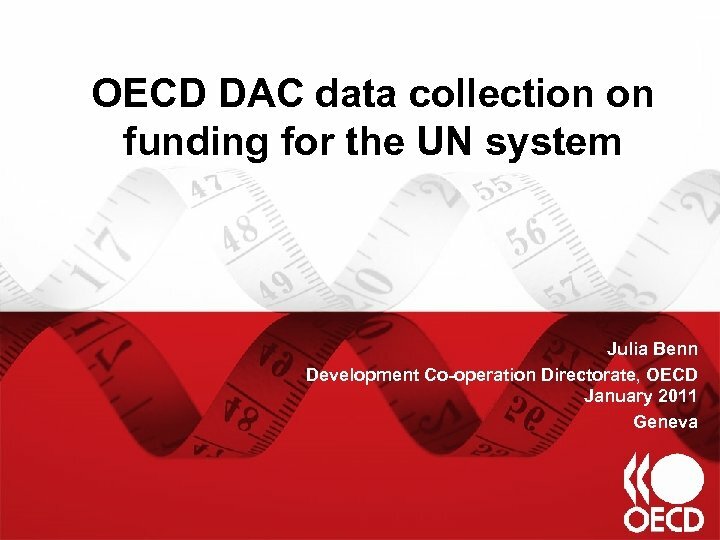 • 4 Development Assistance Committee (DAC) of the OECD. 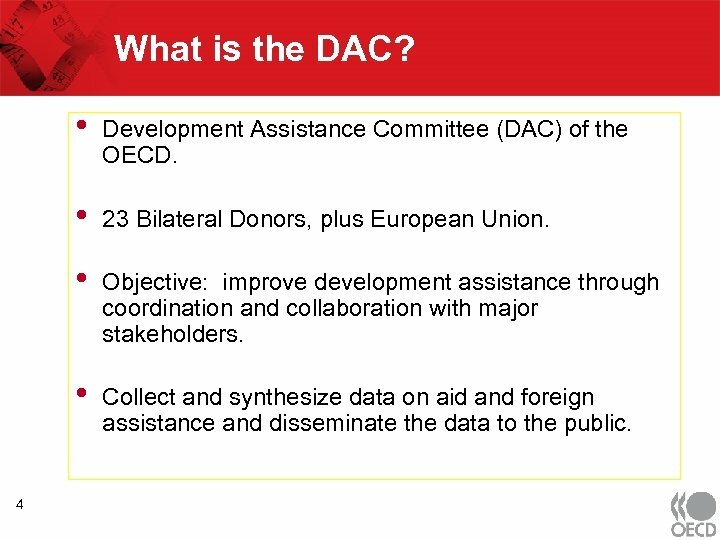 Collect and synthesize data on aid and foreign assistance and disseminate the data to the public. 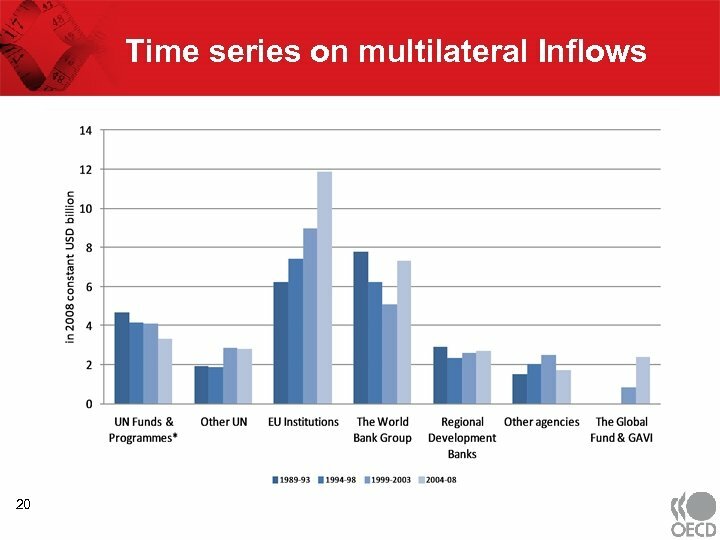 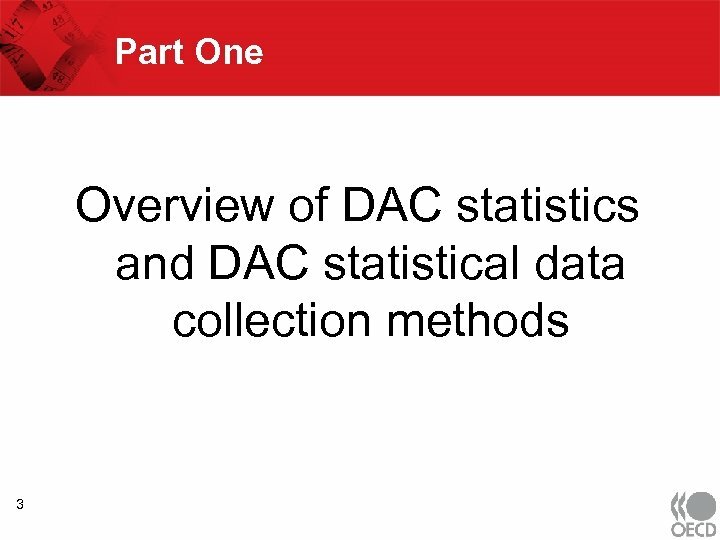 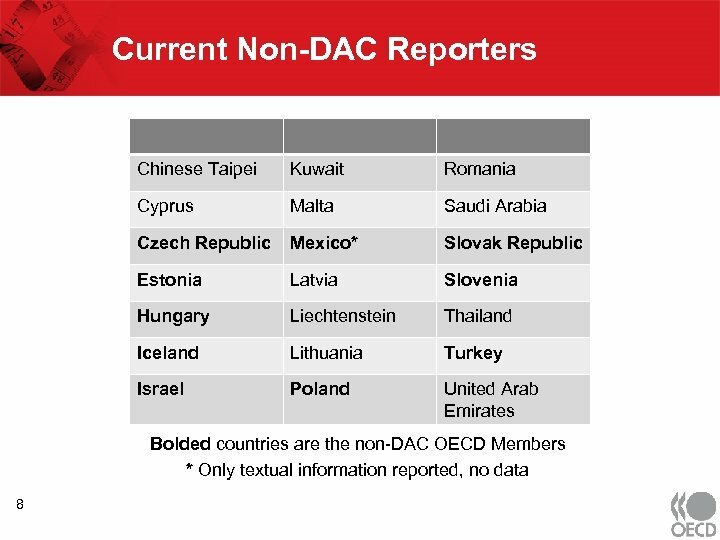 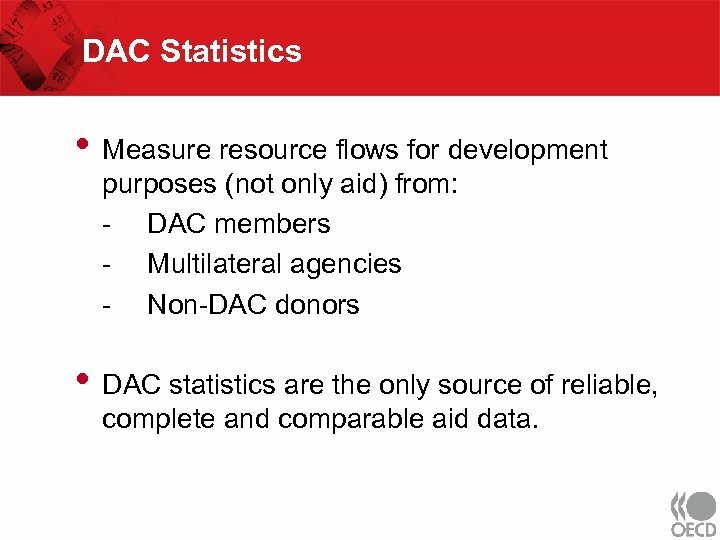 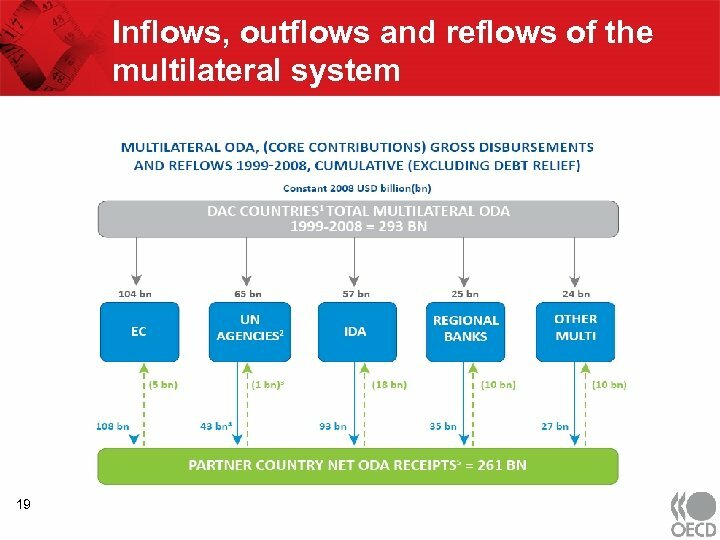 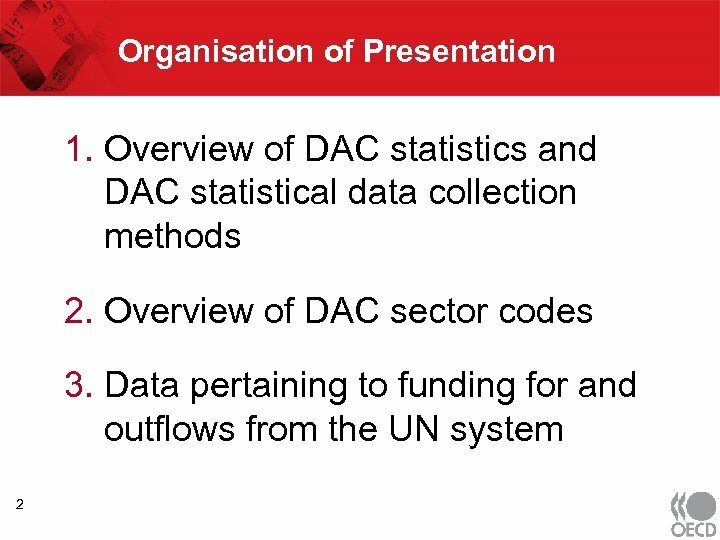 DAC Statistics • Measure resource flows for development purposes (not only aid) from: - DAC members - Multilateral agencies - Non-DAC donors • DAC statistics are the only source of reliable, complete and comparable aid data. 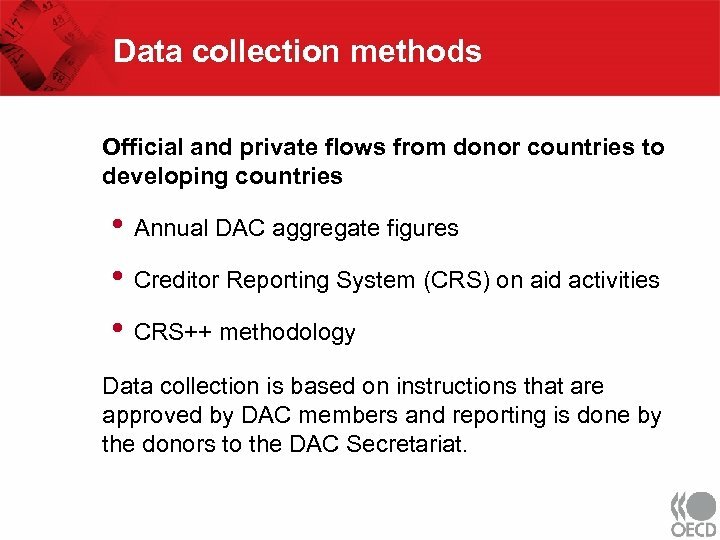 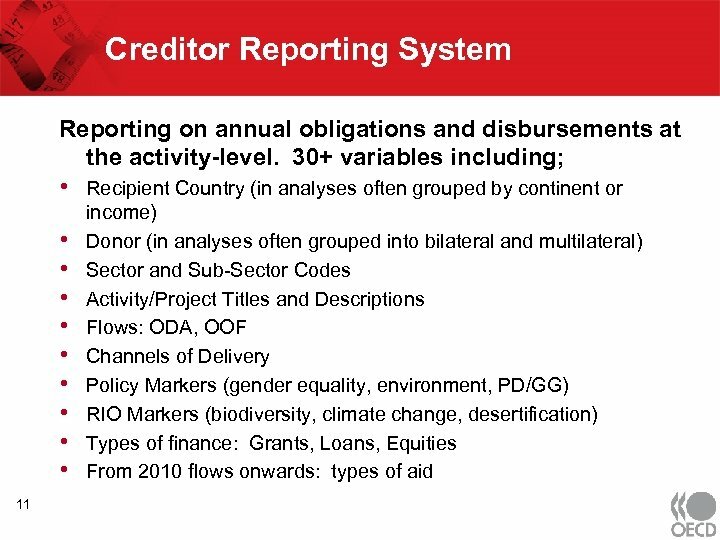 Data collection methods Official and private flows from donor countries to developing countries • Annual DAC aggregate figures • Creditor Reporting System (CRS) on aid activities • CRS++ methodology Data collection is based on instructions that are approved by DAC members and reporting is done by the donors to the DAC Secretariat. 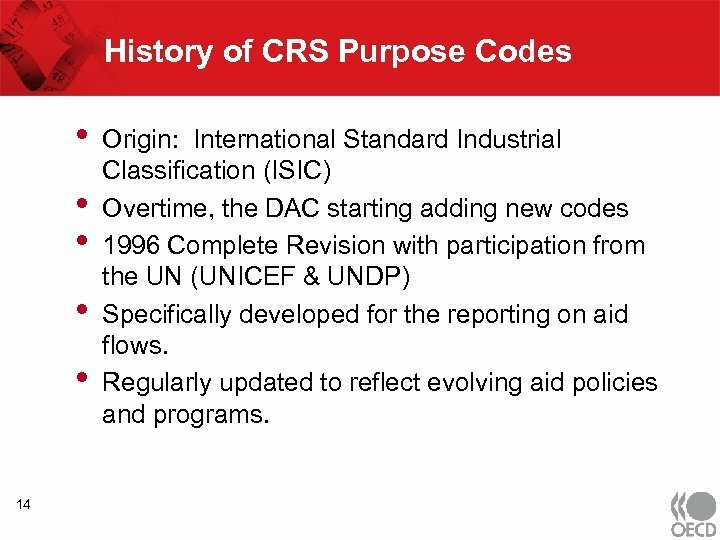 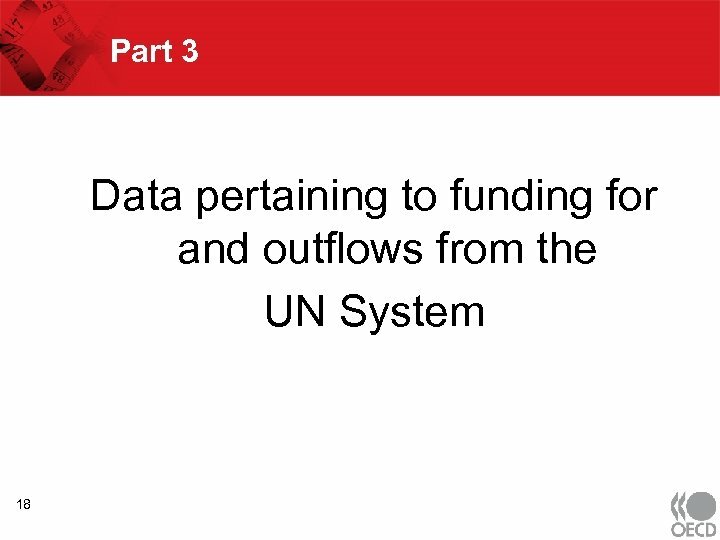 History of CRS Purpose Codes • • • 14 Origin: International Standard Industrial Classification (ISIC) Overtime, the DAC starting adding new codes 1996 Complete Revision with participation from the UN (UNICEF & UNDP) Specifically developed for the reporting on aid flows. 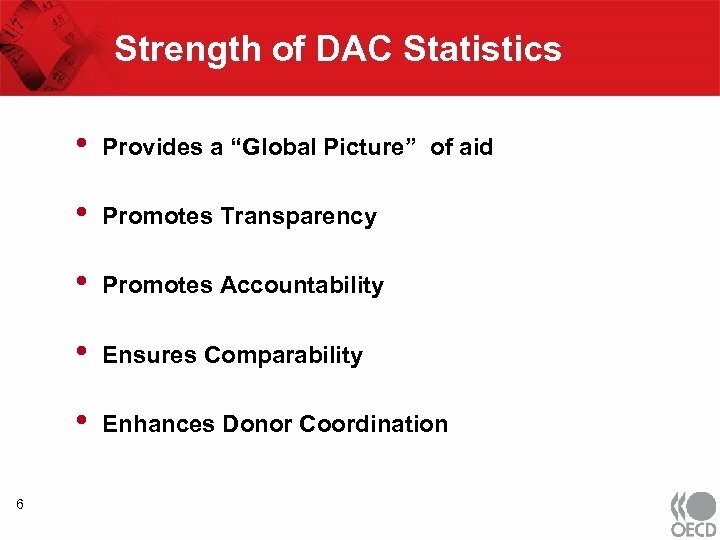 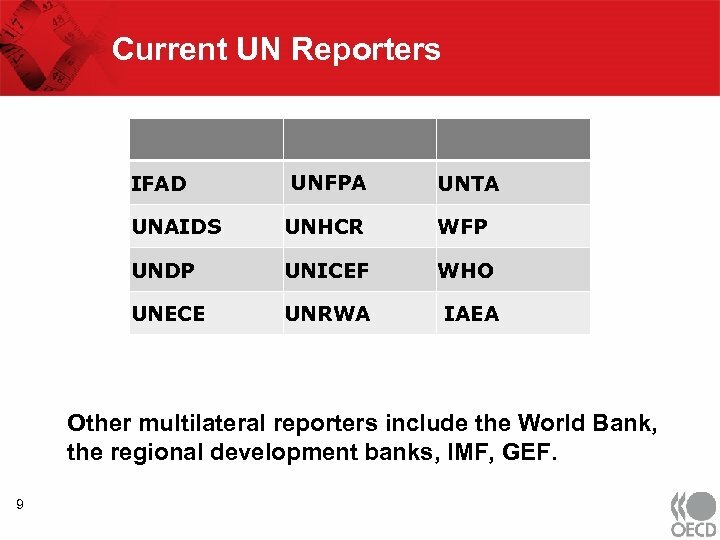 Regularly updated to reflect evolving aid policies and programs. 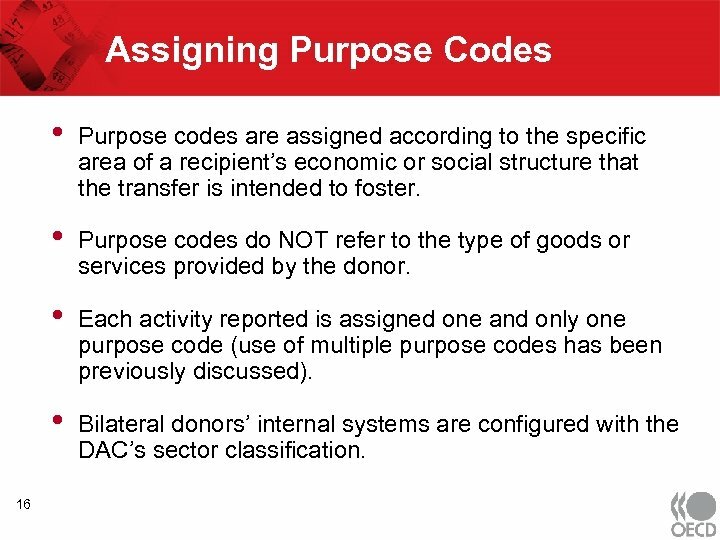 Assigning Purpose Codes • • Purpose codes do NOT refer to the type of goods or services provided by the donor. 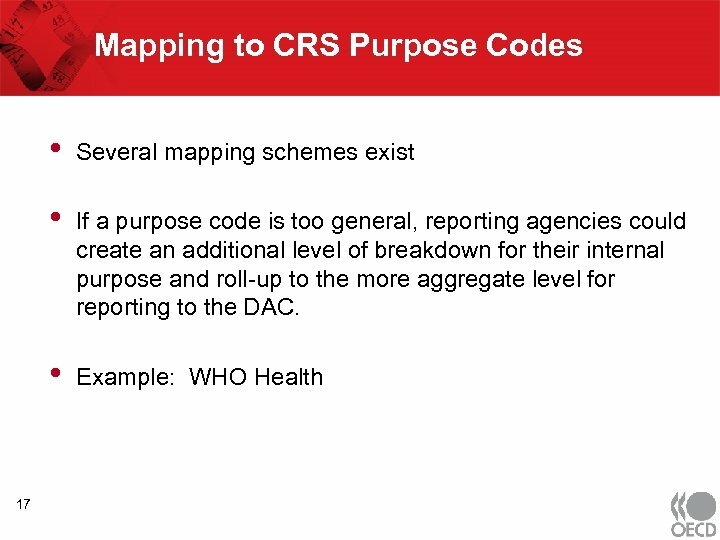 • Each activity reported is assigned one and only one purpose code (use of multiple purpose codes has been previously discussed). 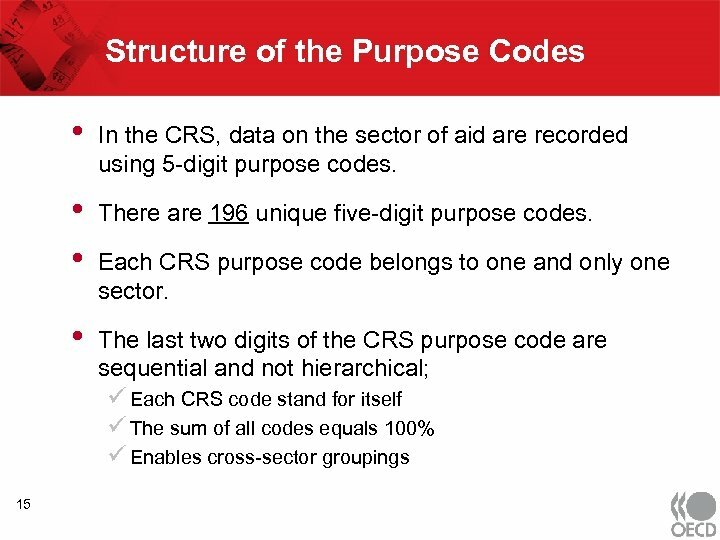 • 16 Purpose codes are assigned according to the specific area of a recipient’s economic or social structure that the transfer is intended to foster. 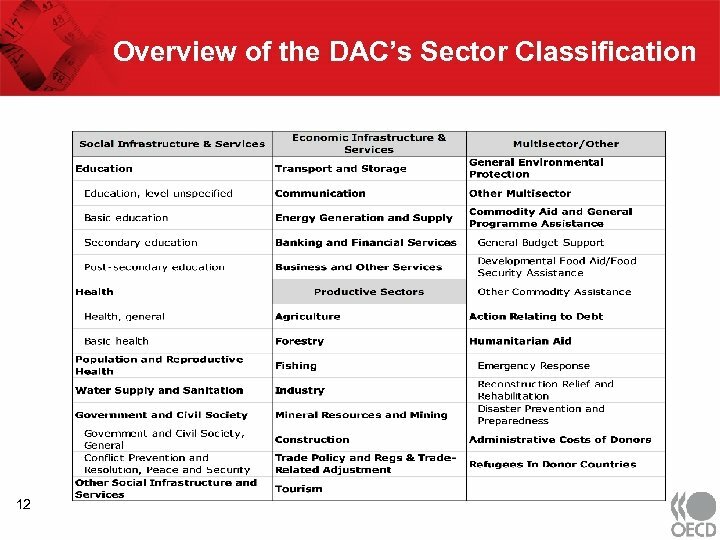 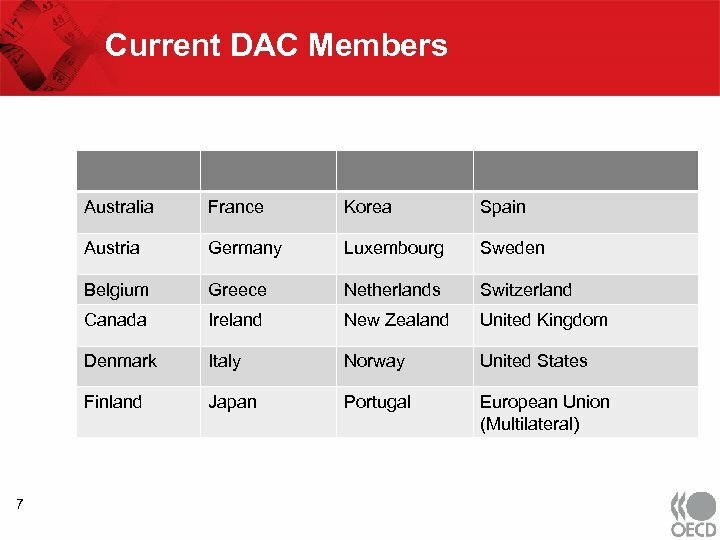 Bilateral donors’ internal systems are configured with the DAC’s sector classification.